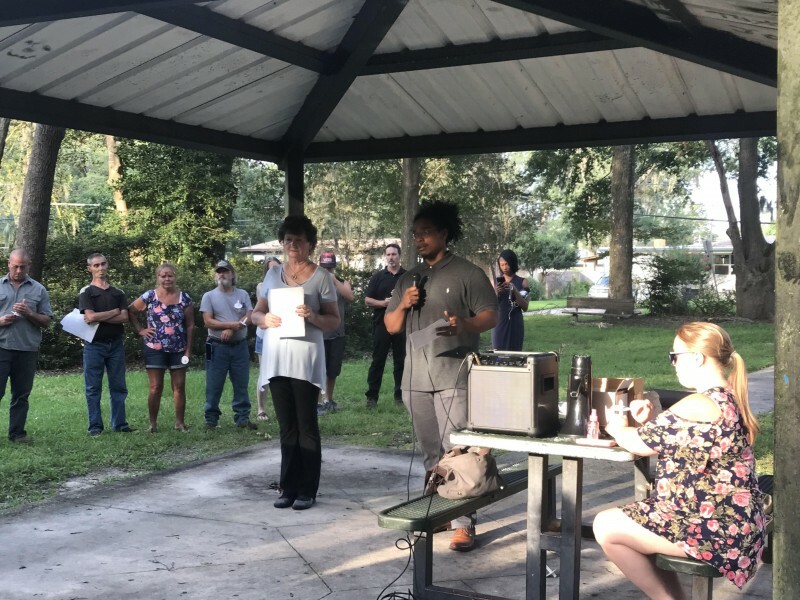 Jacksonville rallies for mentally ill man killed by JSO cop | Fight Back! Jacksonville, FL - On July 13, around 45 people, including family members of Harold Kraai along with the Jacksonville Community Action Committee, Jacksonville Progressive Coalition and other community members gathered for vigil in the San Mateo area of Jacksonville to protest against this police killing of an innocent civilian. Harolf Kraai was a 52-year-old mentally ill man who was gunned down by Jacksonville Sheriff’s Officer (JSO) cop Richard Futch on the morning of July 7. Kraai, known by his family as Uncle Bert, called police under distress, saying he didn’t wanna live anymore. In less than ten seconds upon arriving, JSO Cop R.W Futch fired more than eight shots at Uncle Bert, one even hitting the front door. Kraai died, bleeding out. Family members say the stench of blood is still on the front porch. JSO is claiming Kraai was charging at police with a knife in his hand, but family members and neighbors are suspicious of that narrative. Neighbors remember seeing JSO officers walking in and out of the house after the shooting, not providing any medical aid to Kraai as he bled out. Neighbors even question if Kraai had a knife in his hand at all. Kraai’s mother Jackie Weaver, thanked everyone for coming to the vigil and demanded the JSO cop who killed her son be held accountable. “We all stand together in strength, and this is what I needed to see tonight,” said Weaver. People gathered, chanting “No justice, no peace” and remembering Kraai as a family man who loved his relatives. The family of Uncle Bert are demanding: a transparent investigation take place with officer dash cam video be released to the public and media; JSO Cop Futch, an over 20-year veteran of the JSO with a history of disciplinary issues on the force, be arrested and charged; JSO police officers to be retrained and more frequently refreshed on dealing with victims with mental issues; Mayor Lenny Curry’s new budget include less money for the JSO but more money for public mental health services and resources to provide for our cities mentally ill; and community control over the JSO. The family and community members vowed to keep organizing.